The Committee on the Grants of Honours, Decorations and Medals (aka the HD Committee) advises The Queen on matters affecting Honours and Medals. 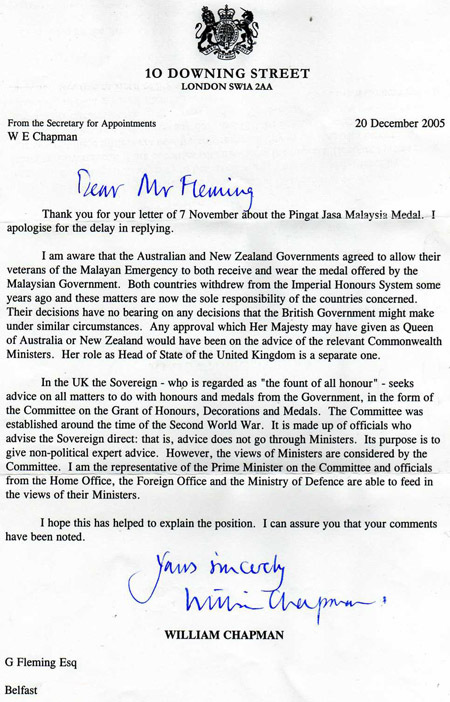 How it fulfills that function is set out in a letter to George from William Chapman, the Secretary for Appointments at 10 Downing Street - he represents the Prime Minister on the Committee. Mr Chapman is joined by the most senior civil servant from the three most important government Departments. The letter explains that the Committee considers the views of Ministers which term would include the Prime Minister, the Foreign Secretary, the Defence Secretary, the Home Secretary, as well as other offices such as the Cabinet Office. But we are told the Committee is non-political! Err ... how does that work! Here are the addresses of the HD Committee so that you can write to them to lobby for our cause. They will, we are sure, look forward to receiving your letters. They are public servants and part of their job is to listen to you. We suggest that you cut n paste an address or, better still, download them all from the text document at the foot of this page then cut n paste the addresses into your letters. When the document is displayed, simply save it to your computer. Why not create a PJM folder and keep all your PJM papers in one place?